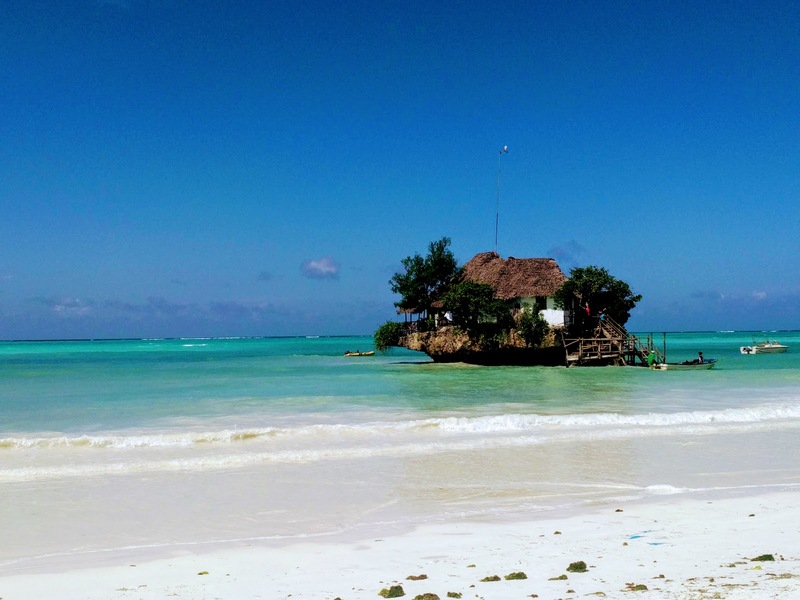 I have dreamed of going to Zanzibar ever since hearing so much about it while living in Oman. M has known of Zanzibar ever since he listened to this song as a kid. When he told me about the song, I didn't believe existed until he found it on YouTube and I still don't recognize it. Do you? 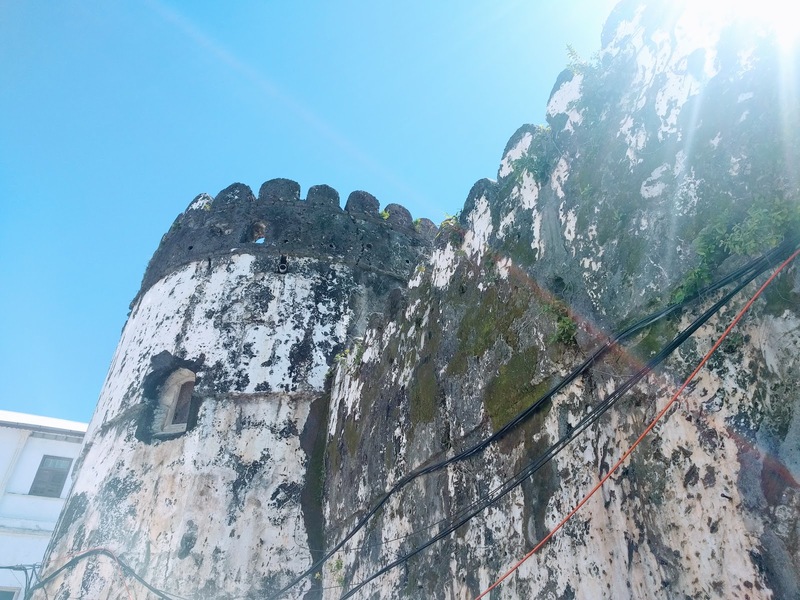 Anyway, Zanzibar was a fantastic and unique experience. We spent the whole time in Stone Town since we only had a weekend and were interested in the culture and history. 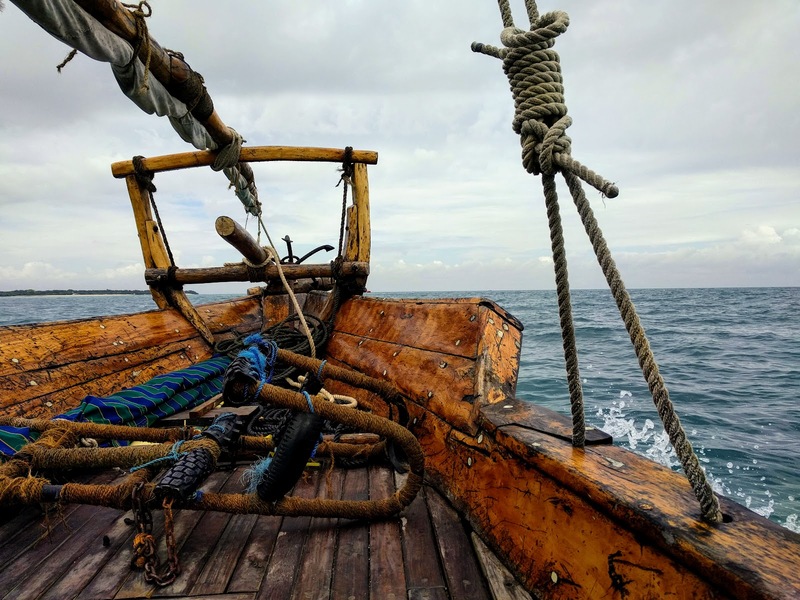 We started the trip by hopping in a traditional-looking dhow, or boat, for a one-day snorkeling excursion on the famous Safari Blue. The biggest bummer of the trip was getting completely rained out of our snorkeling experience after a few minutes of murky views and getting stung all over by sea lice (or something close to that, which we didn't know existed). We ended up huddling on the boat under a tarp as we were pelted with cold, heavy rain. As a consolation, we did get closer to wild dolphins than we'd ever been - we could see a bottlenose swimming right by us! 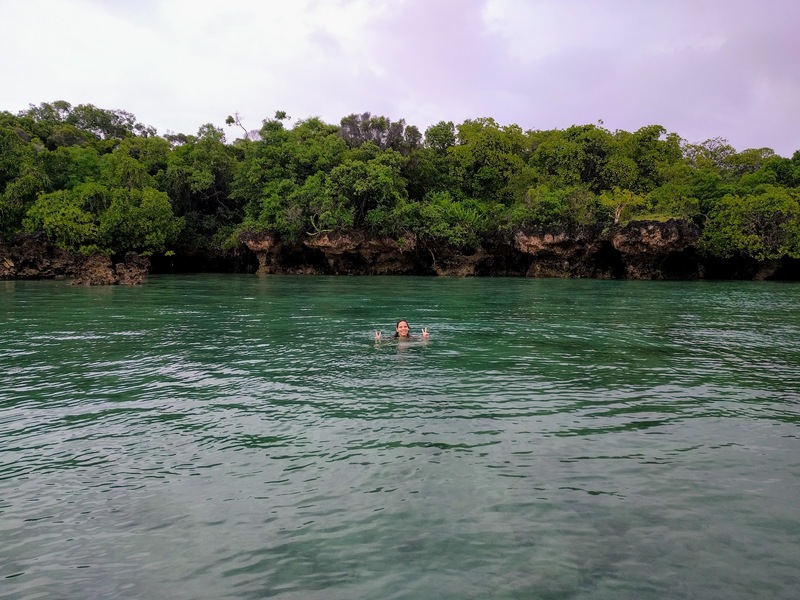 It also stopped raining in time for our stop at a sandbank (the first photo of this post) and the Blue Lagoon, where we got to swim up to the mangrove trees. Lunch was very tasty, and the main food was followed by a tasting of local fruits. Some we had never tried before - like (very sticky) jackfruit and baobab seeds! 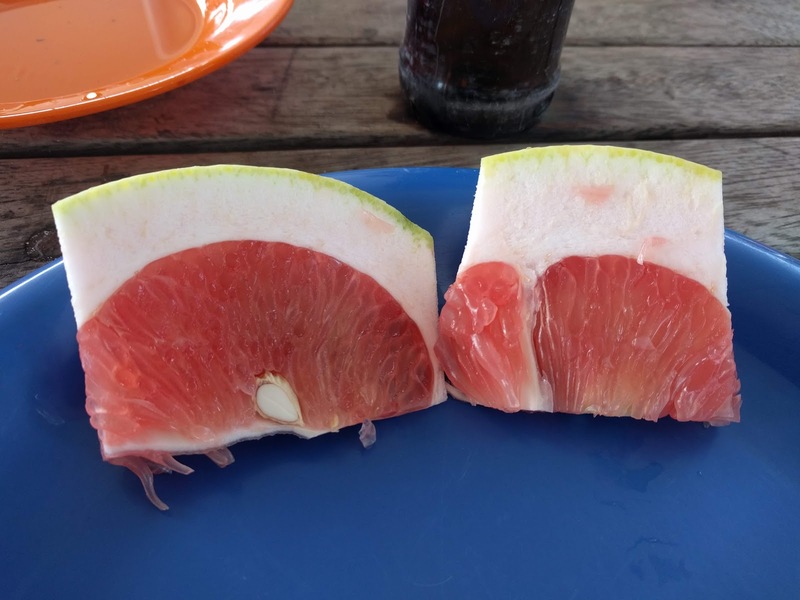 Others we were just surprised to see, like this grapefruit that just did not look like the grapefruit we expect from the U.S.
We wrapped up the day with dinner at Emerson Spice Tea House, a rooftop restaurant with a 5-course set dinner menu. 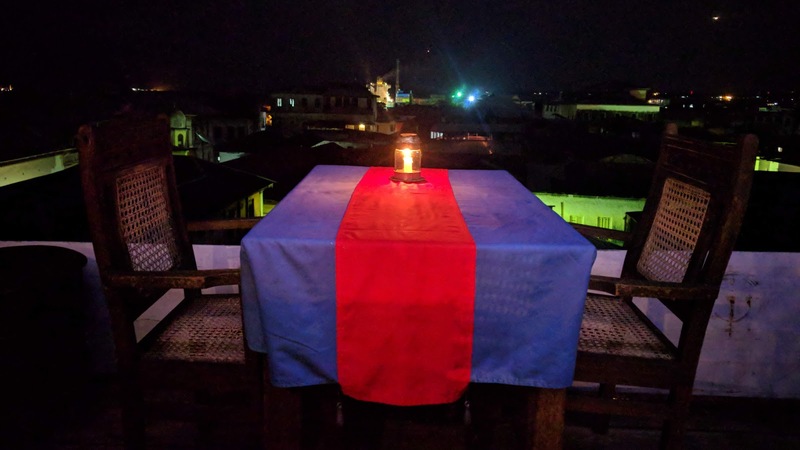 The ambiance was lovely, with a candlelit view of Stone Town at night. Unfortunately, we would not recommend the food - to be honest, we were not impressed. The next day, we tried our luck at The Rock Restaurant, perched literally in the ocean (at high tide). 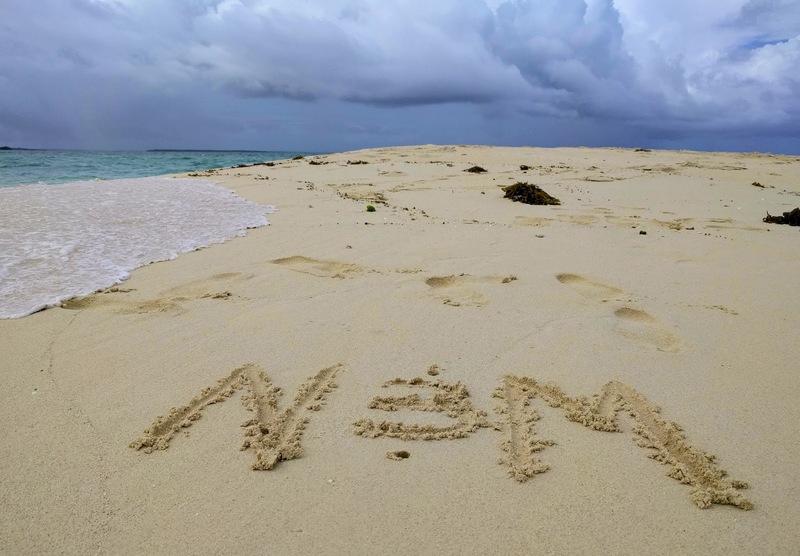 (You get from the beach to the steps of the restaurant by boat!) The gimmick was actually very cool, there were nice seating options inside and outside the dining room, and the food was delicious. If you go, we recommend reserving in advance online here and checking the tide schedule here to make sure you get there for that perfect high tide experience. I'm going to take a break from talking about our fun experiences to point out a heartbreaking phenomenon that seems to plague every corner of the world at this point: garbage! 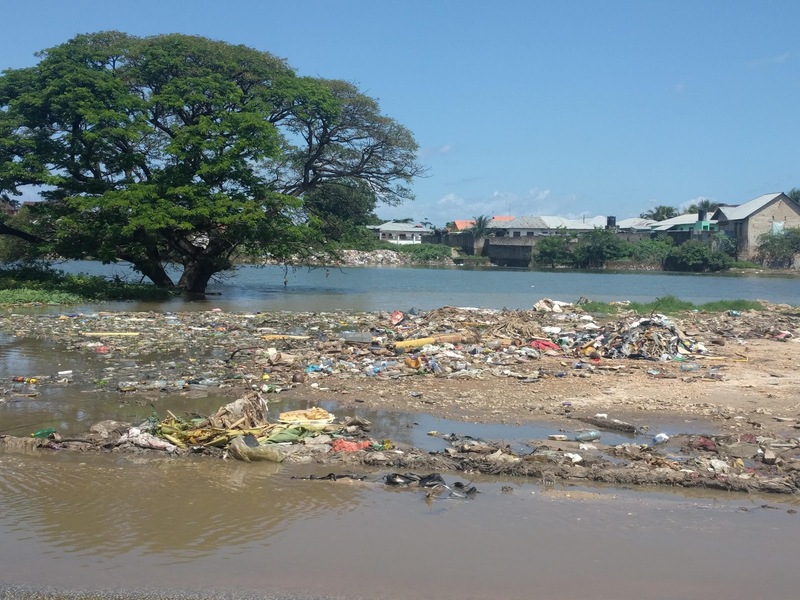 Even though the Zanzibari beaches and waters looked very pure in many places, you could see trash at the high tide shoreline or in less well-maintained areas. I captured the view below on our way to The Rock Restaurant. It was awful! Our planet deserves better. 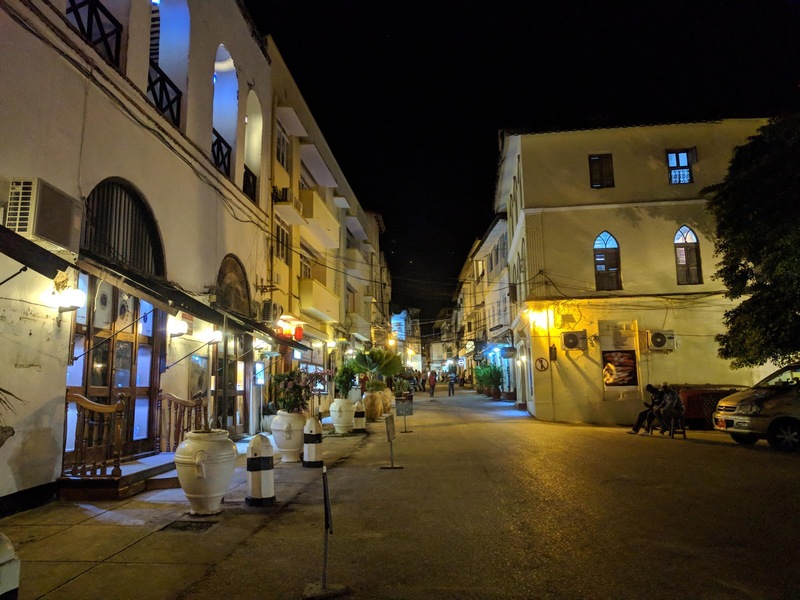 Now that I've gotten that out of the way, Zanzibar was buzzing at night. 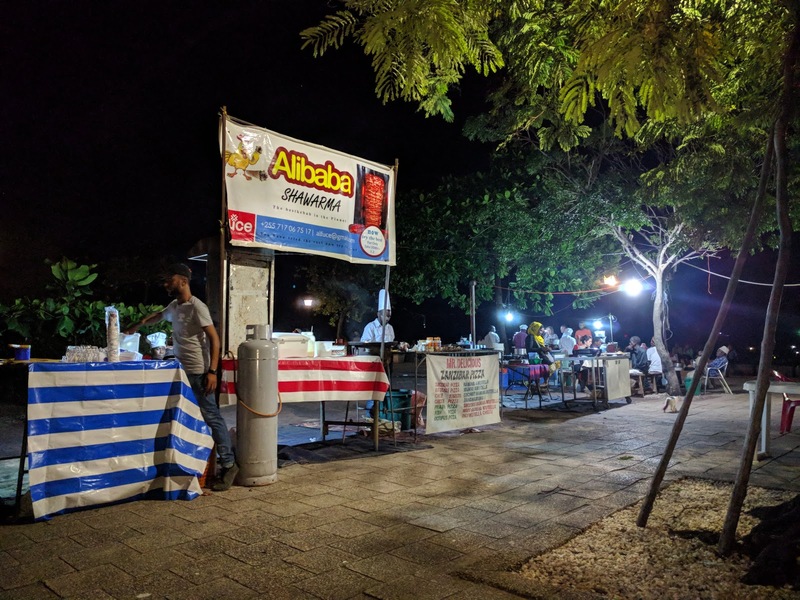 We felt very safe walking from our hotel to the nearby night market at Forodhani Gardens. Similarly to everywhere else in Stone Town, we were accosted there by a multitude of hyper-competitive street vendors, tour operators, and others trying to get some of our tourist money. I respect the hustle, but I also appreciate it when they take "no" for an answer instead of following us around until M yells at them. 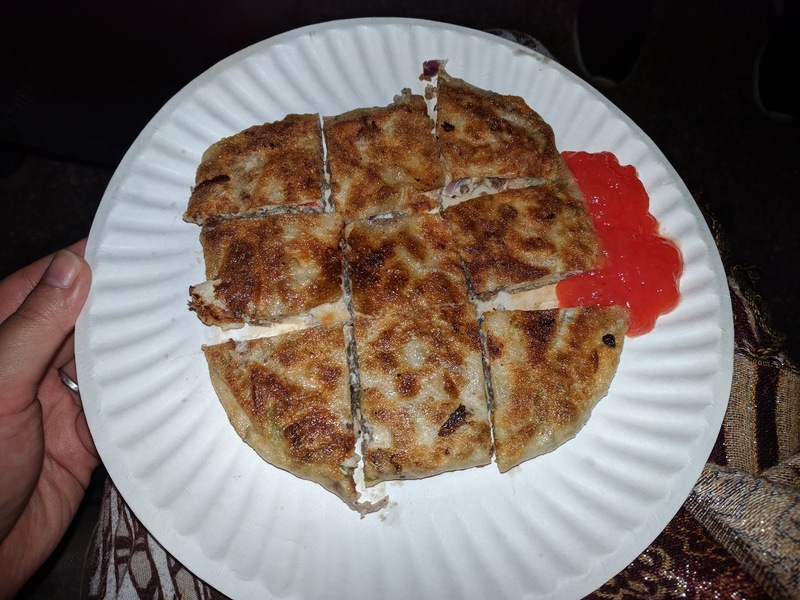 In the end, M settled on a shawarma and I tried a "Zanzibar pizza" - a fried, thin, crepe-style pancake with egg, ground beef, laughing cow cheese, mayonnaise, and vegetables served with "ketchup" (definitely not the same as American ketchup). I actually loved the Zanzibar pizza, but I wouldn't consider it even remotely related to an actual pizza. We also enjoyed a fresh squeezed sugar cane juice. Our last day was our history-focused day. Some of the buildings we wanted to see were under construction, but others like the Old Dispensary pictured below were thankfully fully visible. 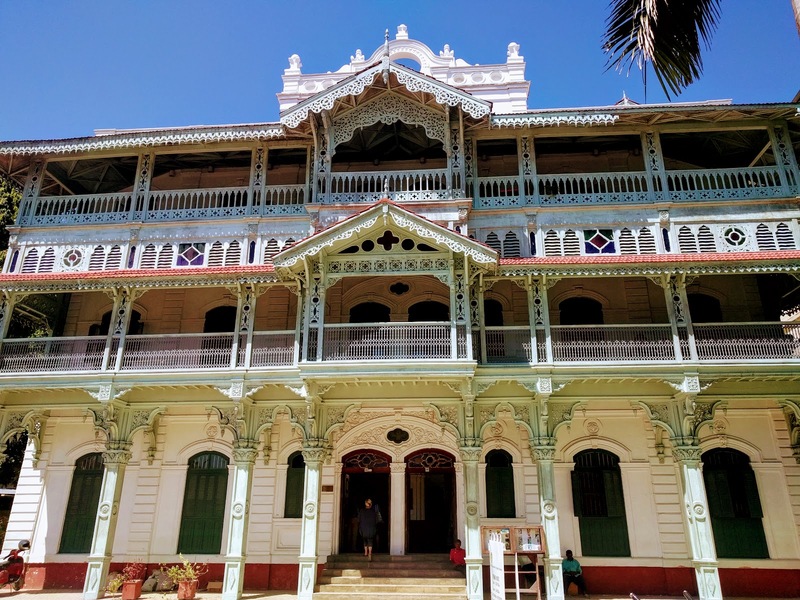 This is just one example of the multicultural influences throughout Zanzibar; for example, we learned the ornate balconies of this building are a hallmark of Indian architecture. We caught a view of the Old Fort, also known as the Arab Fort, which reminded me of the many forts I had seen in Oman. We also swung by Mercury House, where Freddie Mercury (lead singer of Queen) once lived. Did you know he was born in Zanzibar? Full disclosure: Queen is a bit before my time, but M certainly appreciated it. The most powerful stop of our trip was the former slave market, now located on the grounds of an Anglican church. There was a small, simple museum set up describing the history of slavery in Zanzibar. I learned a lot, like the fact that farming cloves was a major incentive for slave labor in the region and that Connecticut was one of the largest ivory import markets in the world for a long time. 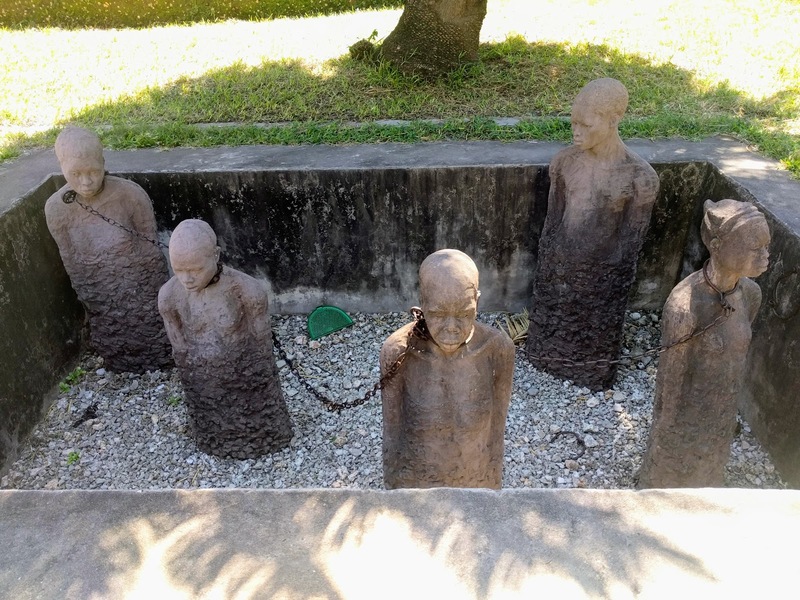 I found the stone sculpture of chained slaves outside especially moving. This stop is a must-see. There's so much more to say about Zanzibar, but I simply don't have the space. I do want to share a tip for those traveling there during Ramadan: the population is predominantly Muslim, and a lot of the regulations are Islamic. Almost everywhere we tried to get lunch was closed, and we weren't allowed to eat our ice cream while walking outside. Definitely plan your food in advance if you go during Ramadan like we did. 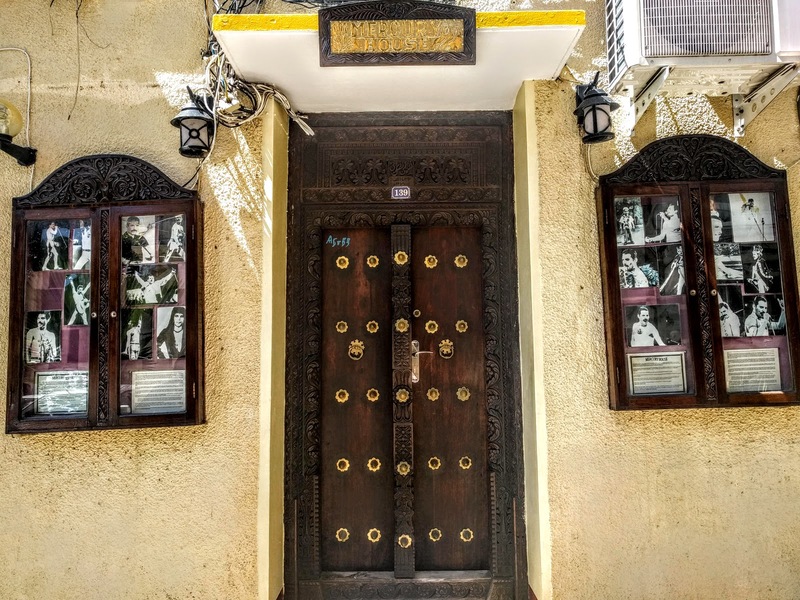 As a final note, I do have to note the famous Zanzibari doors. 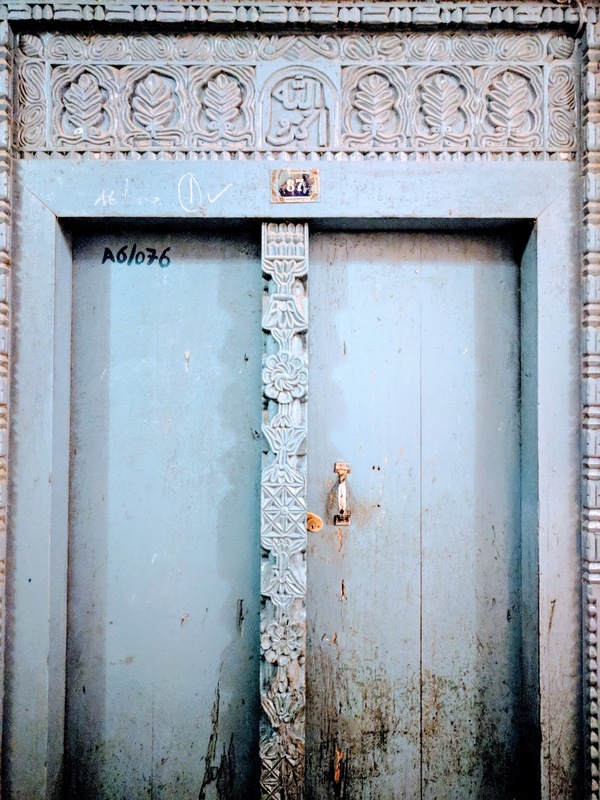 The brass-studded ones visible on doors like the one pictured earlier at Mercury House were supposedly for protection against elephants! We also noticed some lovely Arabic inscriptions like the one above. Many of the doors seemed to tell their own story about the history of that building and its occupants, which was fascinating. 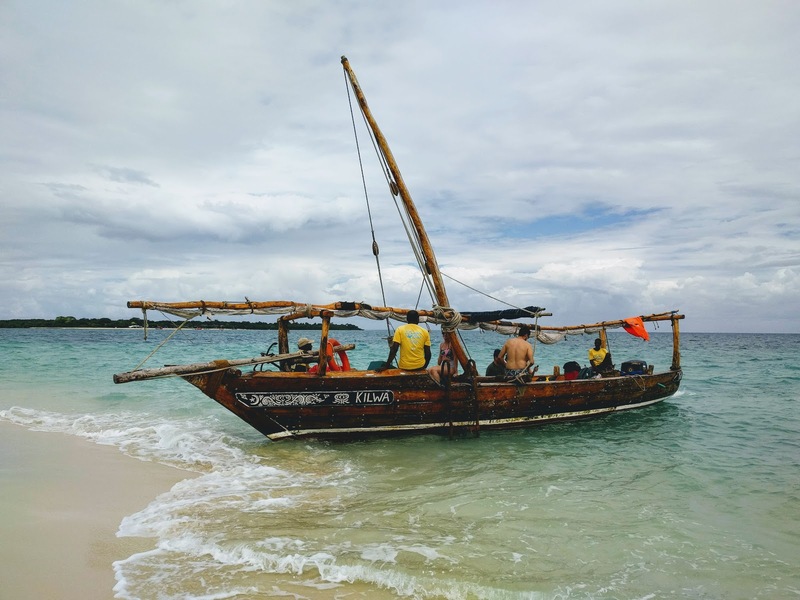 All in all, we highly recommend Zanzibar for the bucket list of anyone who's willing to explore an interesting new culture (and doesn't mind spending more money than planned)!